Tedrick’s Roofing is committed to installing quality roofs. At the same time, we strive to provide safe, efficient, and sustainable roof selections to many homes. Asphalt is one of the most recycled materials in the United States. It is also the main component found in 94% of roads and 80% of roofs in the country. Given its popularity, it’s only right that we find a way to recycle it. Recycling old asphalt reduces the need of new oil. Recycling the mineral part helps conserve natural resources. The best part is shingle recycling saves everyone money. According to GAF’s blog site, taxpayers save money from paving while roofers reduce their energy needs. According to Energy.gov, a cool roof absorbs less heat and reflects more sunlight compared with a standard roof. These roofs have a highly reflective type of paint, tile or shingles, and sheet covering. 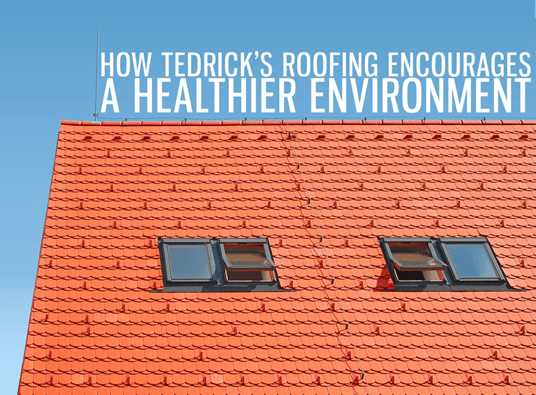 At Tedrick’s Roofing, we use advanced materials to decrease heat load on roofs. In return, this lessens the cooling costs of homeowners. The cool roofing in Des Moines that we install increases the energy efficiency, aesthetic value, and overall performance of homes. Adding a skylight to your roof lets in more natural light during the day. At night, you can enjoy a beautiful view of the night sky. By having a skylight installed, you can use less of your electrical lighting. The best part is we install different styles, including fixed, remote control tilting skylight, and solar tube tubular skylight. Our team can help you pick the most suitable style for your roof. Just let us know what you need by getting in touch with us. These are just three of our sustainable initiatives that help lessen environmental waste, save energy, and reduce carbon emissions. Aside from asphalt shingle recycling, skylights, and cool roofing in Kent, WA, we also advocate solar powered roof ventilation. We would love to discuss our green practices with you. Just call us at (877) 212-9355 today to learn more about our products and services. We also provide roof maintenance, repair, cleaning, and replacement.